A campaign can be played by playing all of the years separately and then adding the results. You are playing solitaire against the might of the Japanese empire. After looking at the setup for the 1942 campaign, I wish I had picked 1943 or 1944. The Japanese navy and their stacks of ships look pretty imposing. As usual, the components from DVG are very good. I believe some early games shipped out with some misprinted counters, but these were all fine. There are eight sheets of counters. They are marked by each separate year of the conflict. 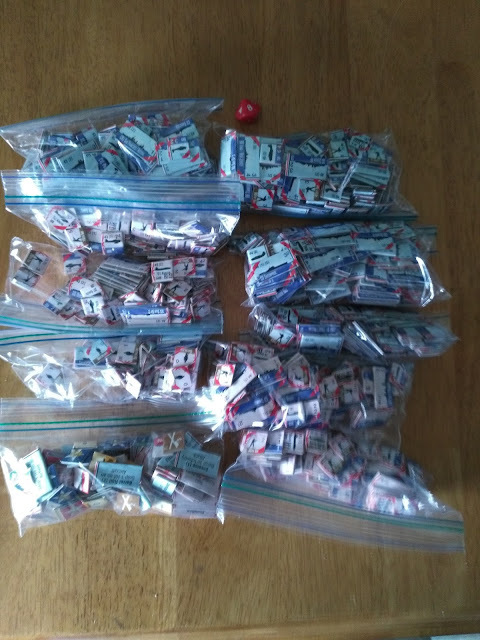 So there will be a Japanese 1942 and American 1942 pile of counters etc, along with numerous supply and movement and other counters. There are also separate counters for land and naval air forces. Each carrier is represented by its own counter, even CVLs and CVEs. Battleships and Cruisers are shown as two of each class to a counter, as in one counter is listed BB Yamato/Musashi and they have combined attack and defense numbers. Destroyers and submarines have counters that show groups of each warship. 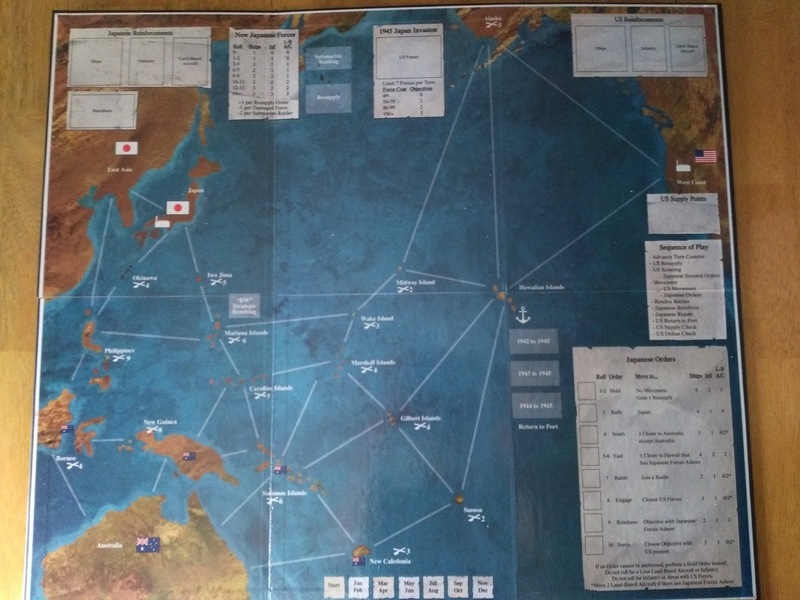 You play on a strategic map of the Pacific area. 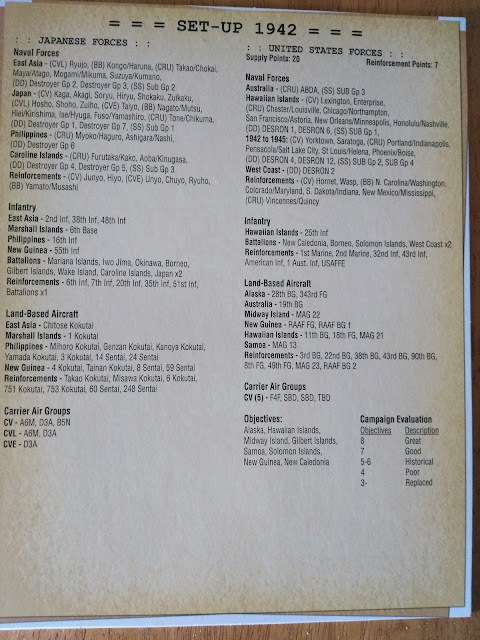 Battles are fought out on a generic 'Battle Sheet'. The rules are clear and well written. The last two pages of the rule book is an 'Extended Play Example'. This game, like most DVG games, has a player log that needs to be filled out. 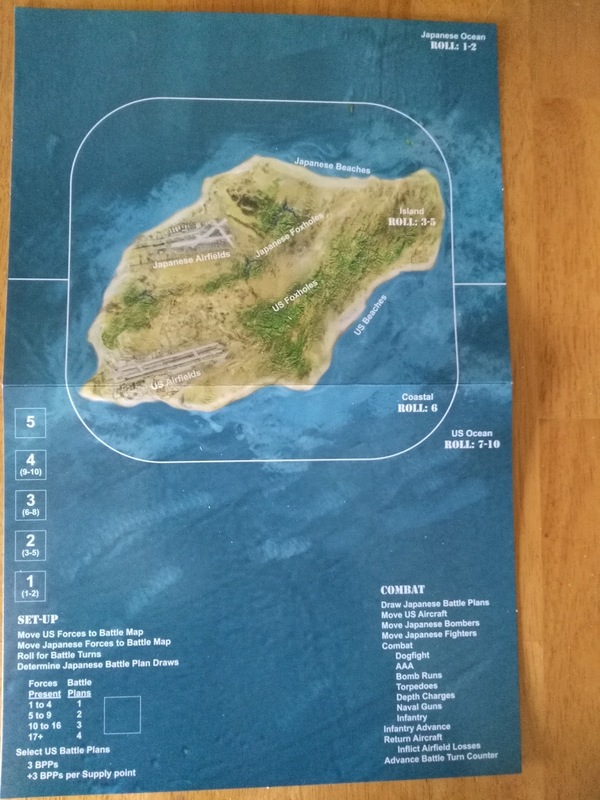 You can copy the one that comes with the game or download and print ones from their website. At the end of each turn is a 'Defeat check'. The player checks his currently held objectives against the campaign evaluation chart. If a player has only three or less objectives held at the end of a turn, he loses. 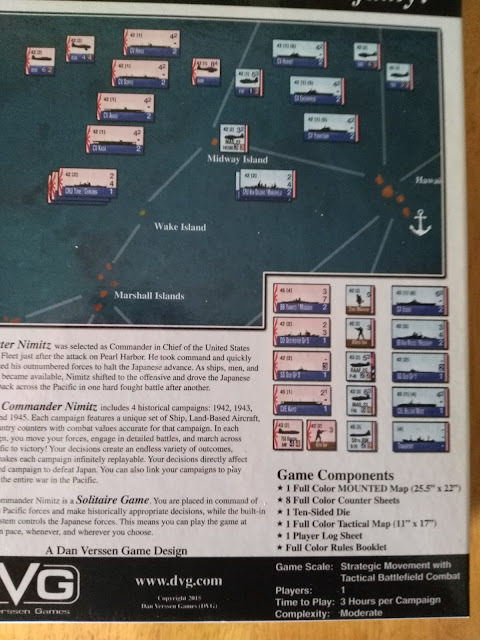 A player can also lose if a Japanese force is in the Hawaiian Islands and the player is unable to destroy all of the Japanese forces on the first turn of battle. The counters come out of the sheets so easily and cleanly that most were already loose in the box on arrival. Luckily my daughter shares my OCD, so sorting counters for a game is like a fun family project. At times, the areas on the board get slightly stuffed with counters. This is totally understandable given the amount of counters you are given to play with. I think DVG hit the nail on the head with the right amount of counters. Having every ship from cruiser on up, as some games have, would make the game play unwieldy. Because the player is essentially playing both sides of the game (using die rolls to decide Japanese play), there is a lot to do on each turn. However, the flow of the sequence of play is well thought out and it is not hard to get into the swing of things. To me, the battle sheet being generic is not a minus. With land, air, and naval forces to control the game gives you enough variables to keep it fresh. The rule book says to start with the 1942 campaign and I concur, even though the Japanese might looks so imposing. 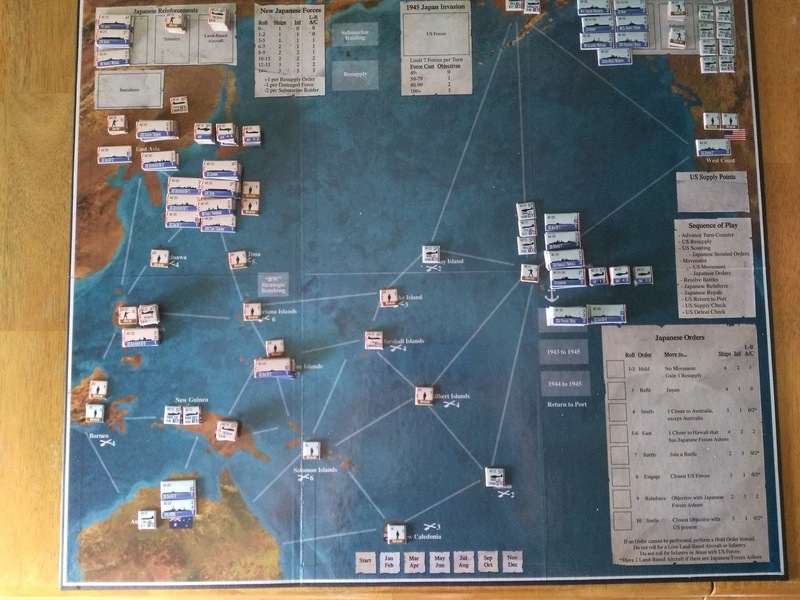 It is much easier to learn the game with the smaller US forces in 1942. The game was nominated for the 2014 'Golden Geek Best Solo Game', and I can see why. Like the other DVG solitaire games I have played it just seems right and plays well. This is coming from a wargamer who never really liked solitaire games before. One point that some people were not happy with was the lack of an actual full war campaign. You can play all four separate year campaigns and check your score against a chart in the rule book for a semi-campaign. 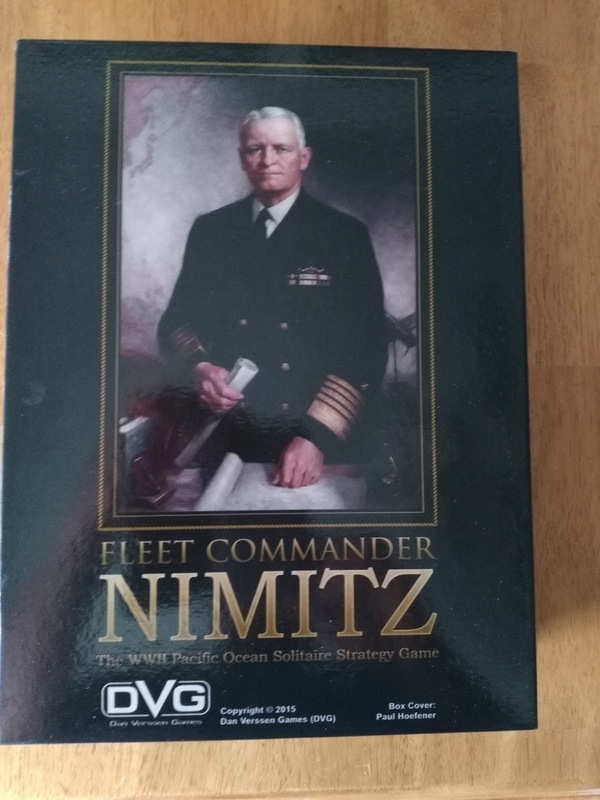 While I can understand their view, in this day and age I am happy to get any wargaming in let alone game the entire Pacific War. Another point that some players do not like is the complete randomness of the game. Some feel the game is not historical enough because of the randomness, while there are others who really like the game for this exact same reason. I am in the latter group. Yes, there is some distortion of history; there has to be to make it a solo game that you want to play through more than once. If all I wanted was history I would read a book instead of playing a game. Subs only attack once each turn during the torpedo step. Randomly select 3 ships and 2 infantry to move to the closest objective with at least 1 US force ASHORE. The poster believes this is how the game was played during beta testing and somehow was changed in the rules. The poster is Steve Malczak. Unfortunately I was not able to play using this change to the rules before posting this review. Hello, I am Jean-Marc from Burgondy (France). 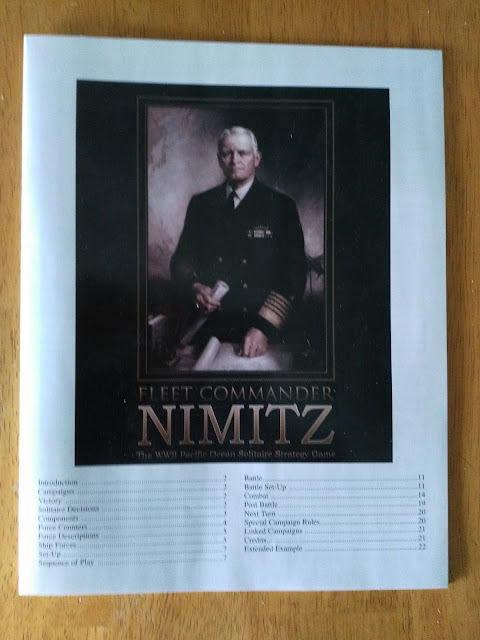 I've bought Fleet Cmdr Nimitz a few months ago and I just try to play. But I have a lot of interrogation about some points of the rules. Can you help me, please ?